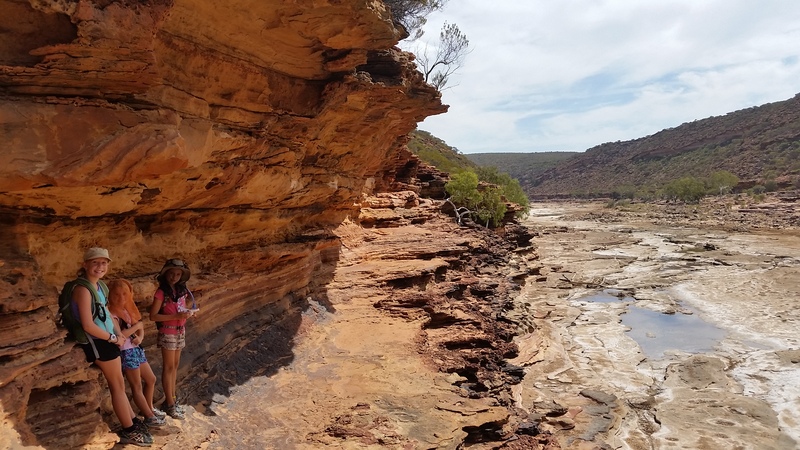 We only had a short drive today from Coronation Beach to Kalbarri, so we extended it out a bit and stopped at a lovely little town called Northampton to look for a geocache. 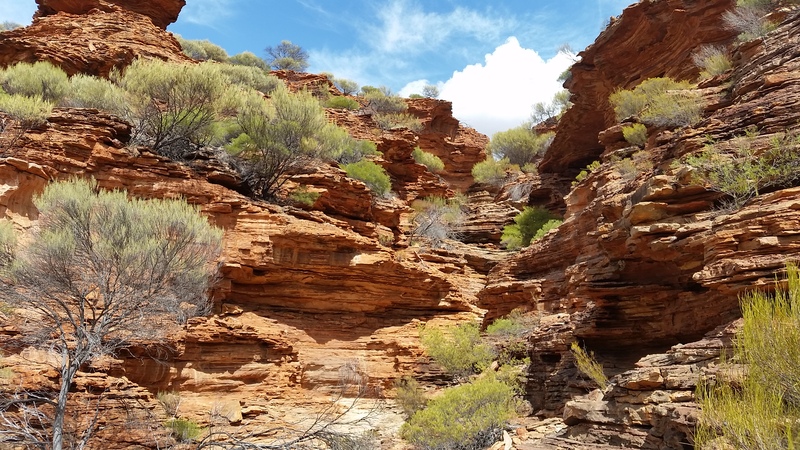 Even having done that, we still ended arriving into Kalbarri well before lunch, where we went straight to the caravan park, set up and proceeded to get through a weeks worth of laundry as well as washing beach towels, bath towels and bedding. Needless to say it was lovely sleeping in beds that didn’t have half the beach in them!!!! 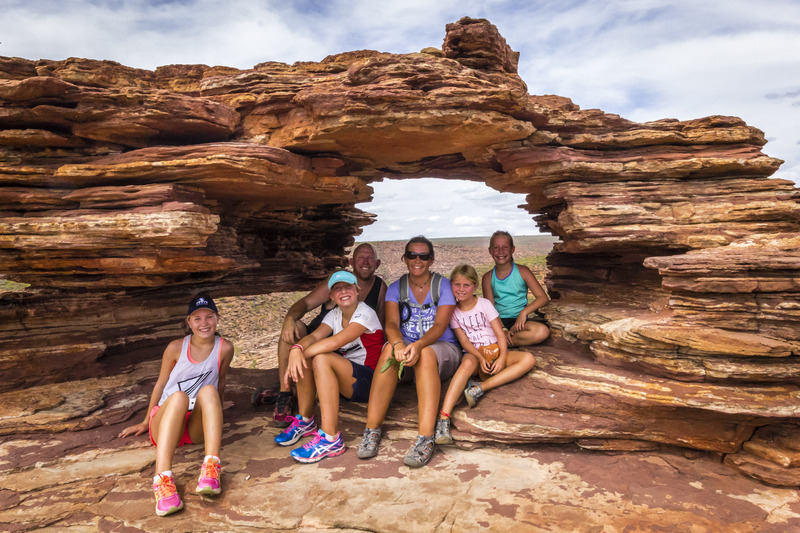 With a warmish day forecast for the next day we got ourselves organised and up early to be out the door by 8:30am to go explore the Kalbarri National Park, in particular the infamous Natures Window. The window was only a short walk from the car park and being so early there was only one other couple there, so we were able to get some great pictures. 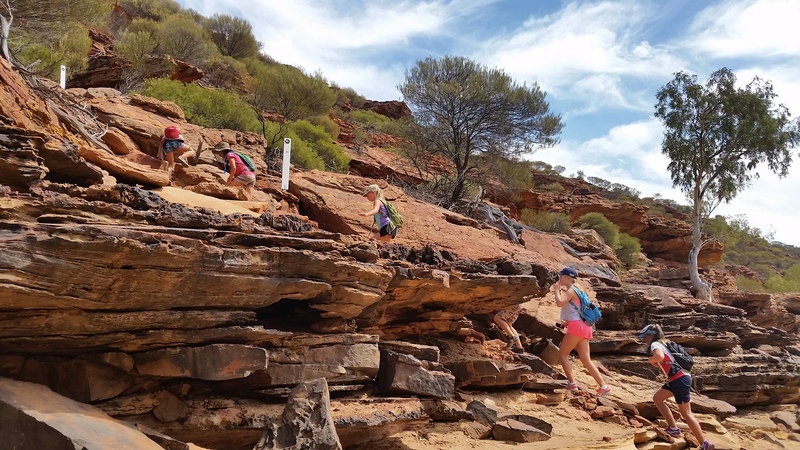 We had also packed our hiking backpacks as we were heading off to do the The Loop hike that takes you to Natures Window then beyond along the cliff tops, then down to banks following the Murchison River as it winds back onto itself, then we finish with a steep climb back up on Natures Window to finish. All up the brochures had said it was an 8km class 4 (difficult) hike, which we all mentally prepared ourselves for that previous night. 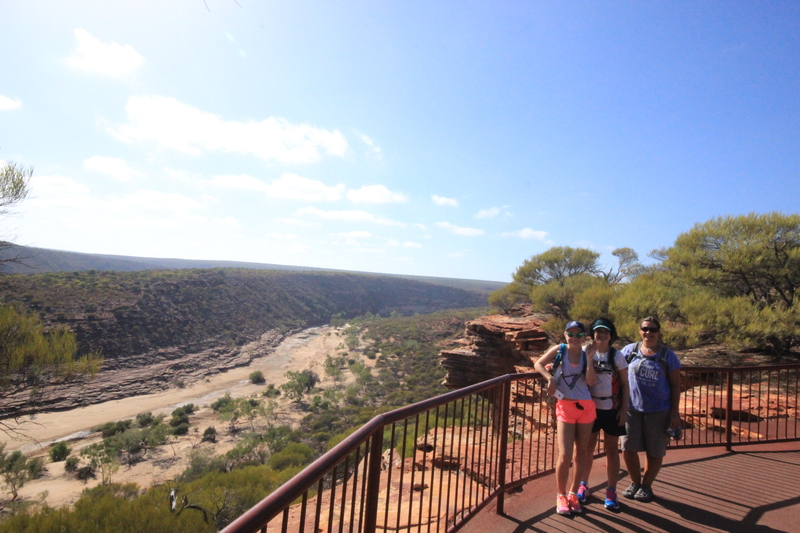 However when we arrived the sign stated it was actually just over 9km, including the Natures Window hike……. So after we regrouped our thoughts we took a hesitant look at the sun peeking its way through the clouds trying to make its way out, deciding to get going so as to try and beat the heat of the day. 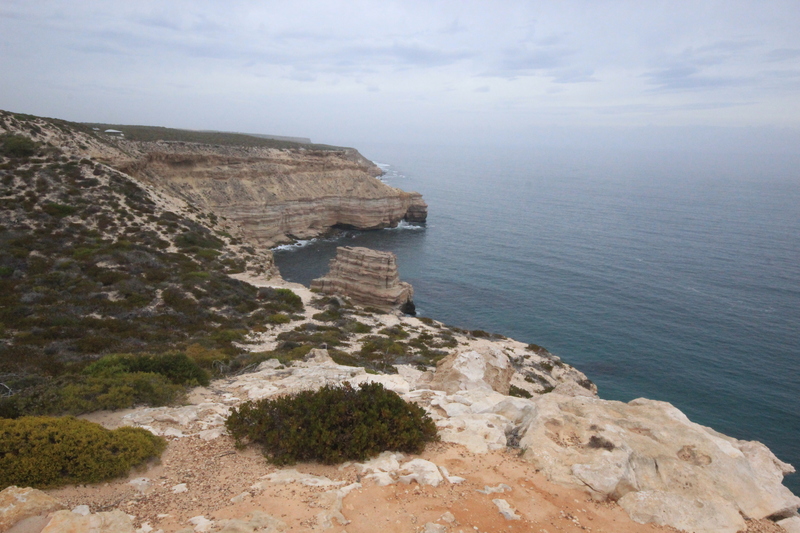 The beginning of the walk along the cliffs was amazing, it had fantastic views and was a great natural hike, we also had plenty of photo opportunities as we were stopping for short rest intervals along the way due to the heat of the sun. 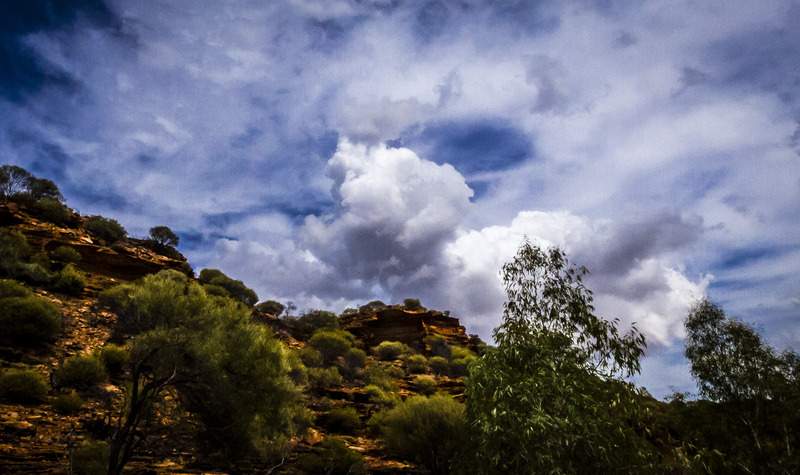 The scenery along the loop hike. 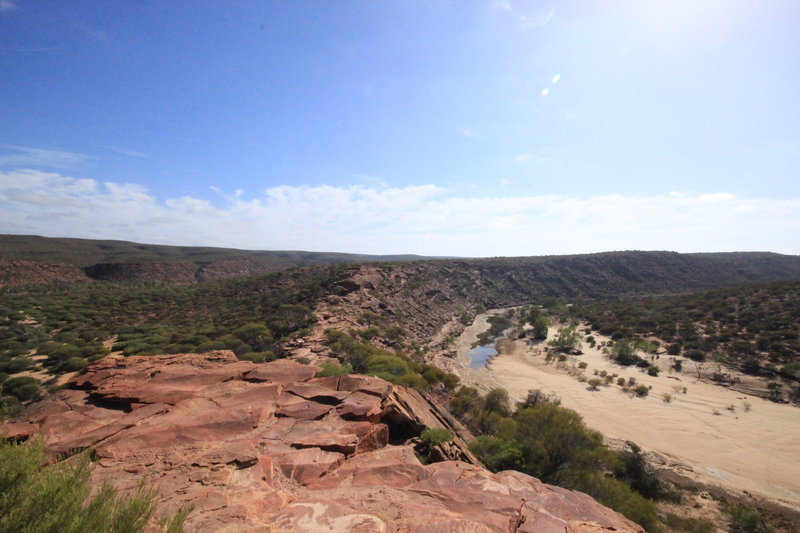 Views of the Murchison River. Beautiful views around every bend. Lunch break under some shade on the river bed. 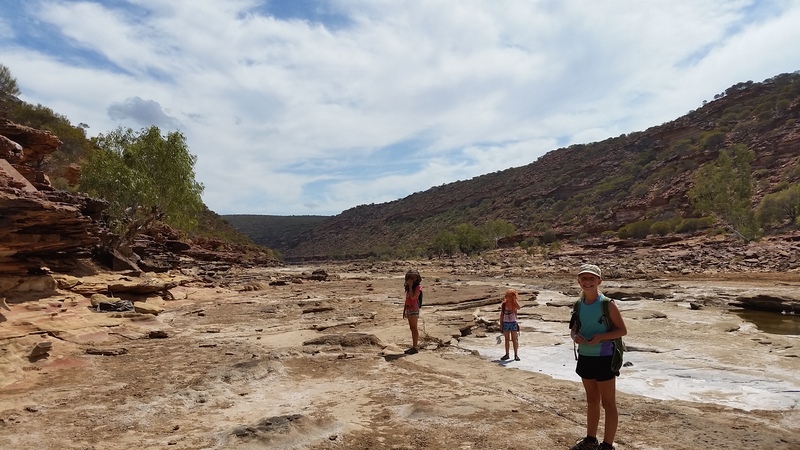 After about 4km we then started to descend into the river bed along the Murchison River where we stopped for a longer break and then we started to follow the riverbed along the river for the next gruelling, hot and draining 4kms. 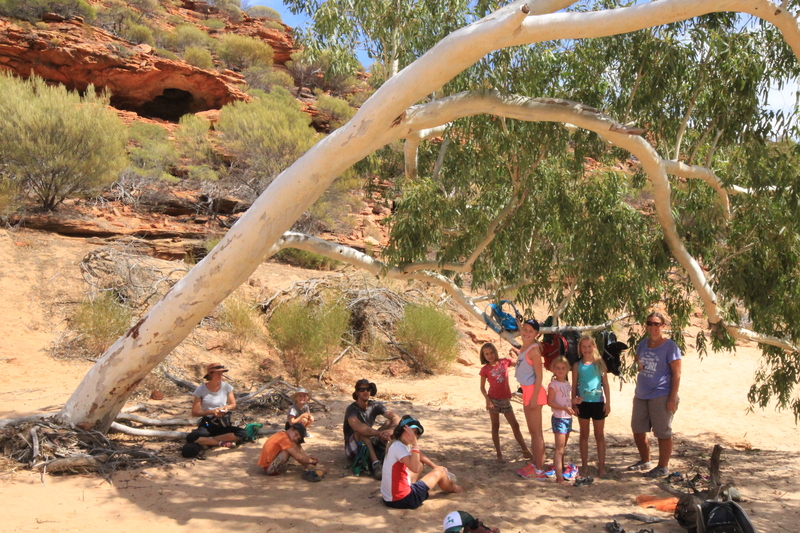 Lots of encouragement, high 5’s, support and of course, music was used as we made our way along the hot dry riverbed, however the kids were stars and didn’t complain at all, except when Jess got stung by a bee…. Finally we had the window and lookout in our sights, Nik and I looking at each other as we heard an Ambulance siren squealing, as we presumed it was taking a heat exhausted hiker to the hospital. 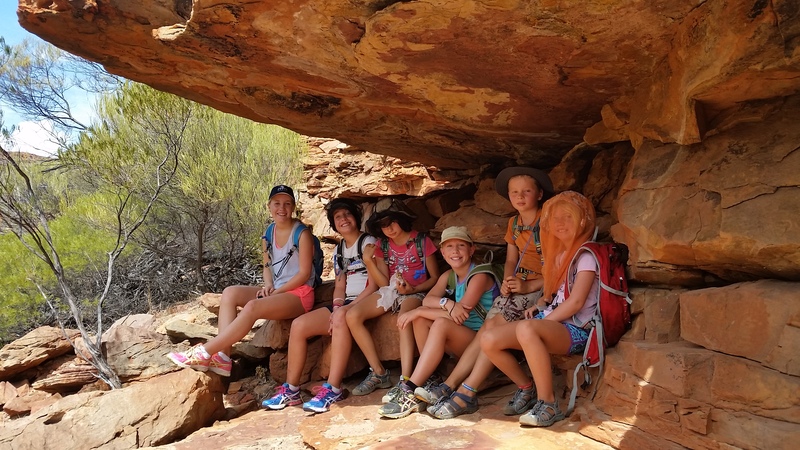 Even though we were organised with back packs, plenty of water, sunscreen and hats we were all certainly wilting and therefore could understand how easy it was to suffer. The mood once again turned jovial though as we climbed the last 500m up to the window, took an extra photo or two and then completed the very last 500m hard slog back to the car park, where we refilled and sculled water from our 10 litre container in the car. One of the many rest stops. 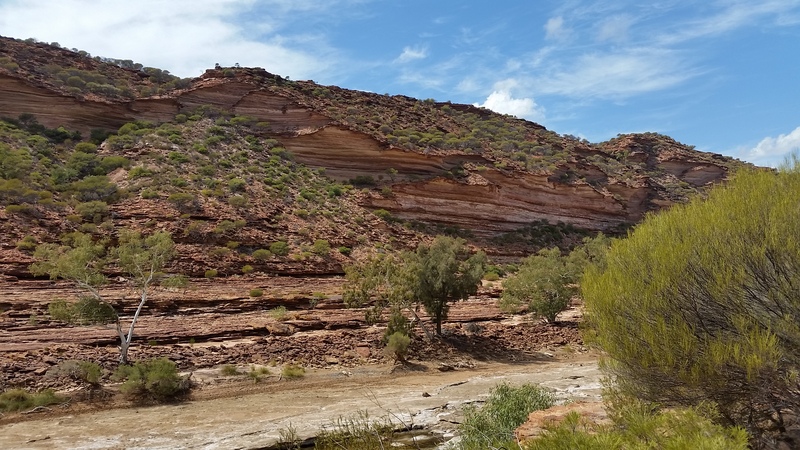 Stages of the walk included walking along the Murchison dry river bed. 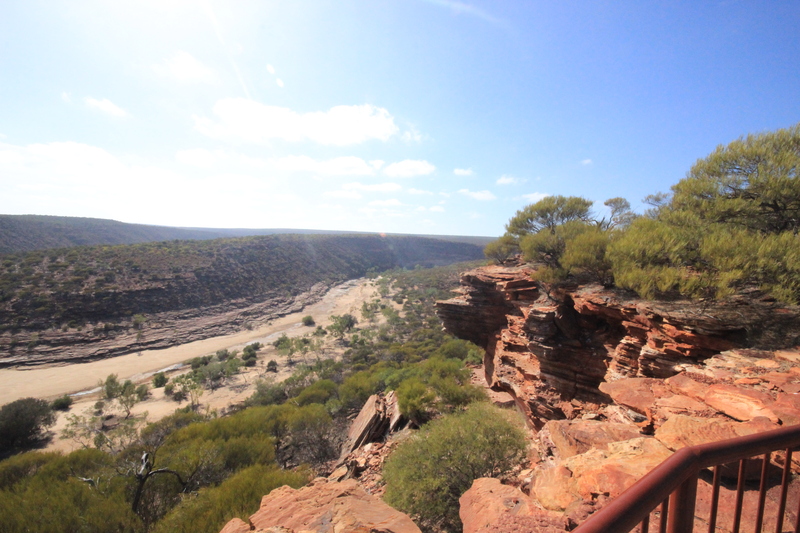 Then climbing back up a bit to walk along the low cliffs along the river. Walking the cliffs along the river bed. Bretahtaking views in every direction. As usual when we got back to the caravan park the extremely exhausted and oh so tired kids threw on their bathers and swam for the next couple of hours before finishing of the last 2 hours of daylight running around the playground and doing gymnastics on the jumping pillow……… Nik and I were then nice enough to let them put on a Harry Potter movie to watch, which of course didn’t have them going to bed until at least 8:30, so needless to say they were actually exhausted when their heads hit the pillow!!! 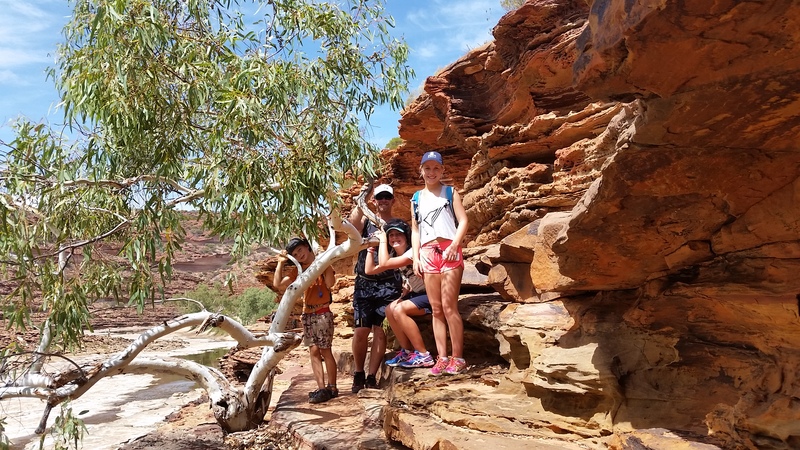 The next day we were all awake at the crack of dawn, Nik went and had a game of golf at Kalbarri Golf Course, Bec cooked up some pancakes and the girls then got stuck into some schoolwork by 7:30am. It was a very productive morning with schoolwork, with them all completing just over half of their weekly subjects, so after lunch we decided to head for a drive, with only a minimal amount of walking this time. 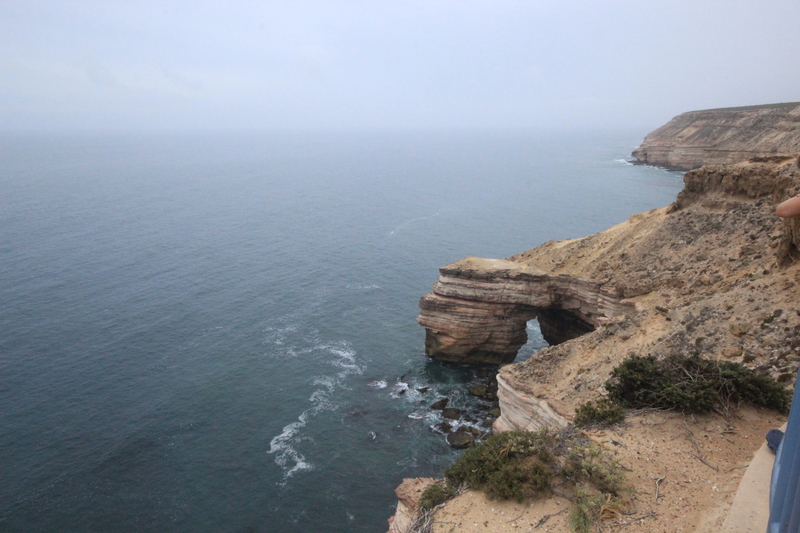 We first dropped Nik off at Red Bluff beach where he was staying put to try some fishing, while we all continued on to the other lookouts for some stunning scenery and hopefully successful geocaching. 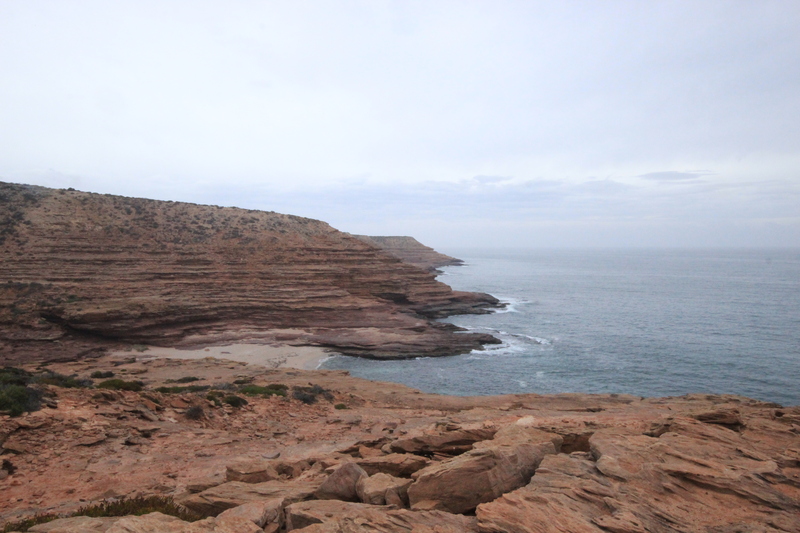 Natural Bridge and Island Rock were our first point of call, located south of Kalbarri within the National Park. 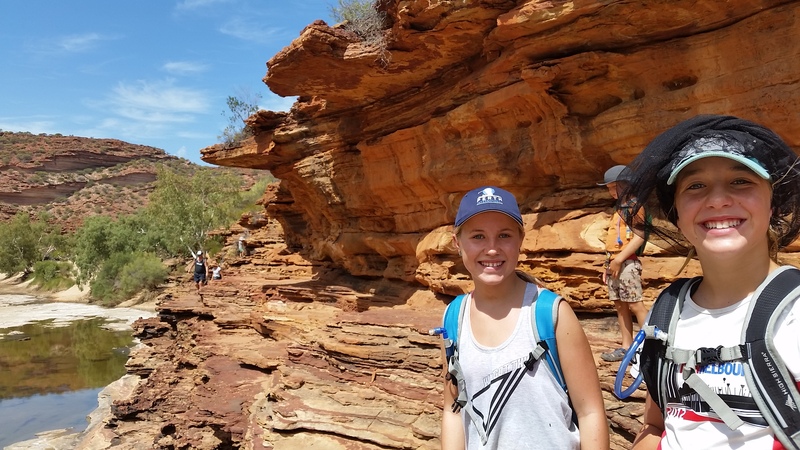 We might have stretched the truth a bit here to the kids as we also ended up doing a shortish 2km stroll between these 2 lookouts……. However the kids didn’t notice as they were too excited about possibly seeing a whale and shark feeding frenzy in the water. Unfortunately it was a long way out, the day was foggy, misty and overcast and we could only zoom in with Simon’s camera. But we were studying it for at least 20 minutes and all came to the conclusion that the big long thing in the water blowing air out of its blowhole was in fact a whale not a dolphin, however we couldn’t be 100% sure that the fins and splashing around it was a shark, although we were fairly confident and Zoe even claimed that she saw its jaws come and open and bite on something in the water……….. So after that little bit of excitement we moved along to our next couple of lookouts, Shellhouse Granstand, Pot Alley and finally Red Bluff lookout where we waved at Nik below still fishing on the beach. SEarching for geocaches at Pot Alley. 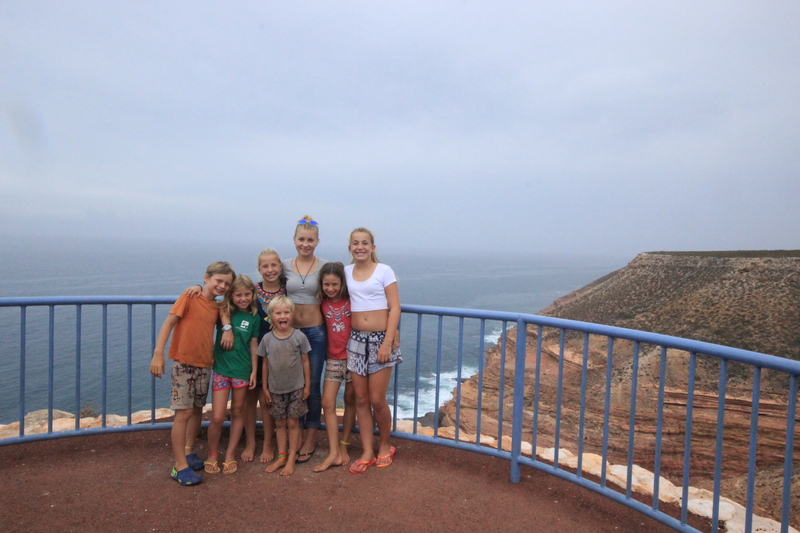 Our 3rd and last full day at Kalbarri we spent the morning doing schoolwork until morning tea then decided to head to Blue Holes for a snorkel before the wind came in. The kids and Nik had a ball in the chilly water, spotting many Rainbow Trout, Whiting and even a groper hiding under one of the big rocks. 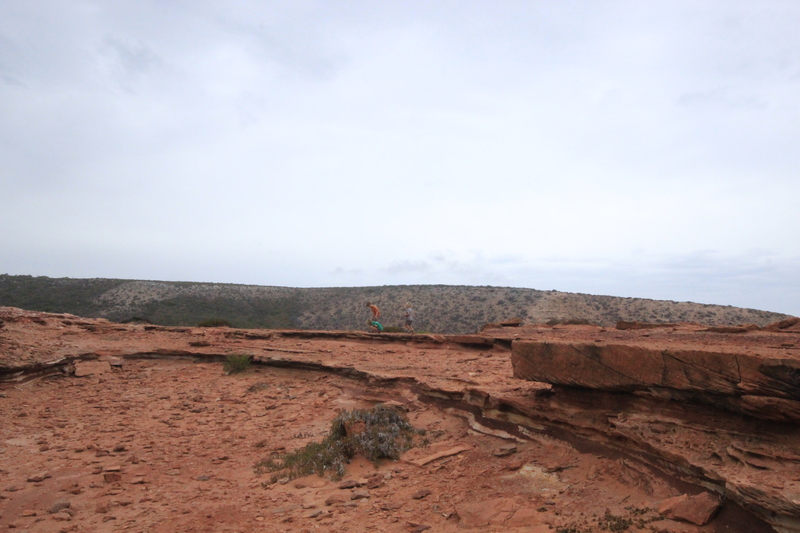 All up we had a great time in Kalbarri, the weather was a bit hit and miss, but we still enjoyed ourselves. However it was time to move on as we continued our journey norther, excited about our next adventure and destination on our OZLAP………. 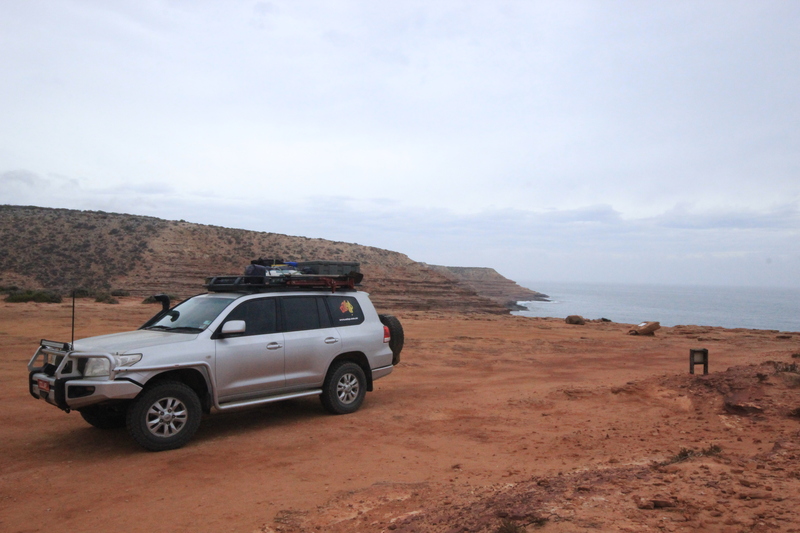 Previous Previous post: Geraldton & Coronation Beach, WA. If you stop in at Carnarvon visit the Morel plantation on the main road into town. Tell them Jo & Rich say hello and enjoy some of there beautiful fruit. Haha, we drove past it today and were nearly going to stop and take a photo of the Morel sign and send it to you!!!!! It doesn’t look like they are open though…. we did get some fresh stuff along the ‘fruit loop’ way. Are they relatives of yours?